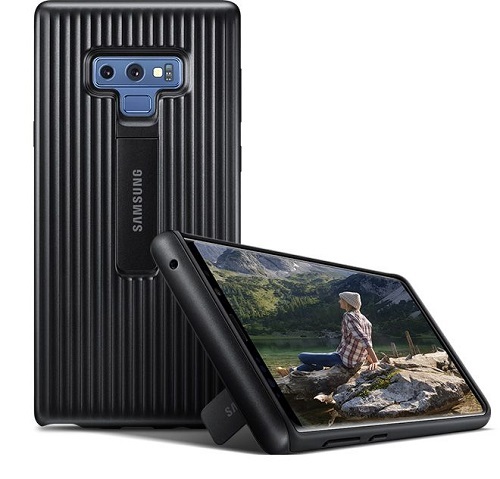 And like every year, Samsung is offering an comprehensive range of official accessories to go along with the Galaxy Note 9. Given that the phablet is a very expensive device (pricing starts at a whopping $1,000) you might want to protect your investment by snapping a protective case on it. Unfortunately, this means you’ll have to take out more money out of your pocket. In the end, it’s up to you to decide whether you really need a protective case or not. Anyway, in case you’re wondering here’s the complete list of official accessories for the Note 9. The roundup also includes a few non-case accessories such as wireless chargers and earbuds. The Clear View cases feature a semitransparent front, so you can view notifications or take calls without opening the cover. The accessory also doubles as a stand, so you’ll be able to watch videos comfortably. On top of that, the cover also doubles as a mirror when not in use. You’ll be able to pick it up in Black, Brown, Blue or Violet. Next, we have the unique LED View Covers which come with a tiny LED display on the front. This shows information at a glance including time, calls, messages, battery status and more. What’s more, you can control and play music through the cover. The case has its own card pocket inside, so you can also store your credit card with you. The LED View Cover is available in Black, Brown, Blue and Violet. Want something more luxurious? The Leather Wallet Cover might be what you need. The protective case is made of genuine Italian calf leather and boasts microfiber lining for increased protection. Like the LED View Covers, these leather accessories have an interior pocket for storing credit cards. Customers will be able to order theirs in Black, Brown or Red. The Protective Standing Covers are a bit more heavy-duty than the options we’ve seen so far. 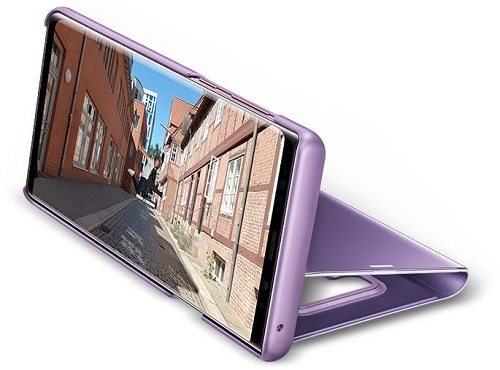 They feature a metal flip-out stand that will allow you to prop your Galaxy Note 9 in a 45-degree angle portrait-style or a 70-80-degree angle landscape style. Available in Black or Gray. The Silicone Cover cases are the most affordable in the bunch. 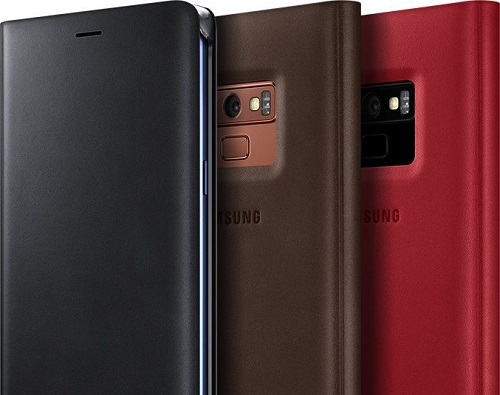 They offer standard protection to your Galaxy Note 9 by simply covering the back and the sides of the device. Samsung sells them in Black, Blue, White and Violet. 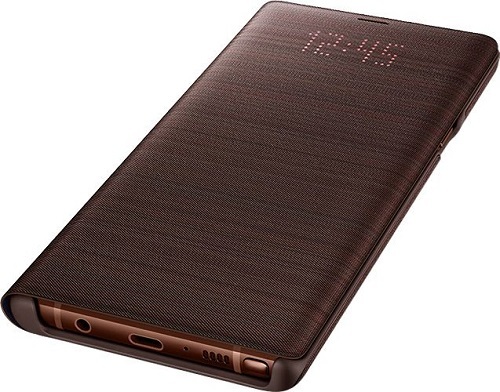 Don’t want a cover that hides away the Galaxy Note 9’s sleek curves? Then you might want to opt for the standard Clear Cover. Transparent and with a slim profile, the case protects your phone while keeping it stylish. 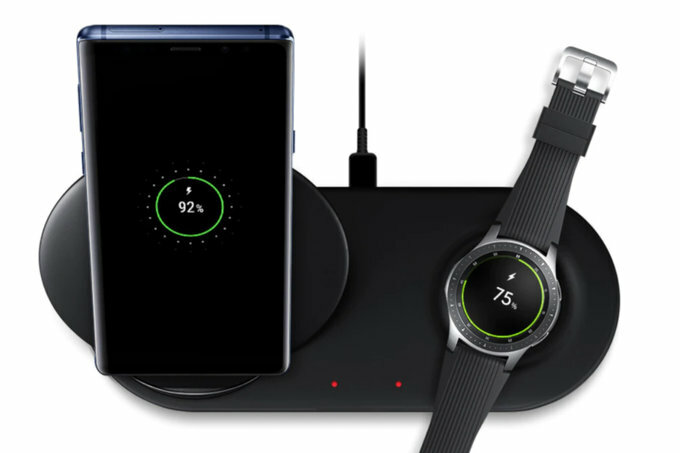 You can pair your new and shiny Galaxy Note 9 with Samsung’s new Wireless Charger Duo. This is a 2-in-1 wireless charger that can juice up your phone and your smartwatch at the same time. Given that this is a universal Qi standard charger, you can charge any two devices that have support for wireless charging, not just Samsung devices. The accessory consists of two fast charging (up to 7.5 watts) lanes. One is a stand, while the second device will have to lay flat on its back to start charging. The Wireless Charging Duo is available in Black and White. A standard wireless charger pad for the Galaxy Note 9 that accommodates only one device. It can be used to charge other devices that support wireless charging. Also available in Black or White. Samsung’s wireless earbuds can connect to your Galaxy Note 9, so you can listen to music, maximize your workouts and more. The buds also work as a standalone fitness tracker and music player. They come with 4GB of storage and are equipped with an accelerometer and heart rate monitor. Get them in Black, Pink or Gray.